The course with a length of 10 km, consisting of two laps. At the end of the 10th km, runners will conclude the first lap as they run through the starting gateway. They will receive a split time and then they will run around the main grounds and embark on the final lap. 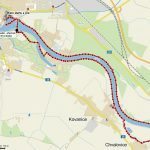 On the final lap at the end of the 15th km: Competitors will come running down the stairs of the bypass bridge and will be directed further up the river towards Poděbrady – Polabec. After about 450 meters (and after having crossed a small bridge), runners will turn around and head back, carrying on with the standard course, which will take runners past the refreshment stands in Chvalovice and then past Kovanice. Teams – the top three teams will be announced, using their calculated average time. The teams must consist of at least three competitors. Women will have the advantage of having their times multiplied by a factor of 0.8. Refreshments: at the start/finish lines, and every 5 km (water, isotonic drinks, fruit, chocolate). At the finish line you will be rewarded in the form of a hearty lunch. Entry fee: 400 CZK (a discounted fee for on-line registration and payment to our account by 22. 12. 2017); 450 CZK by 21. 3. 2018, 500 CZK by 16. 4. 2018, 600 CZK (for payments made on-site the day of the race or after 16. 4. 2018!). The entry fee payment must be sent to the following Fio bank a. s. account number: 2900918406/2010 (IBAN: CZ1420100000002900918406, SWIFT/BIC: FIOBCZPPXXX). As a variable symbol, use your registration number, which is displayed on the sign-up sheet or in your confirmation email. You can pay by wire transfer from your account, or at some Fio bank branches, you can pay in cash at the cashier’s desk. The payment must appear as an item on our daily bank statement at least five days before the race, so please take this into consideration as delays associated with payment operations can occur! 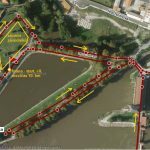 Finish: Nymburk – “Na Přístavě” street (the harbor) – below the fortification the walls, the time limit for receiving an official time is 3 hours, i.e. 1:00pm. The finish times are recorded by smart cards. Safety instructions: Competitors participate at their own risk. They are obliged to abide by the rules of the race, the organizer´s instructions and general legislation. We recommend getting a medical examination beforehand and accident insurance for the day of the race.